It's not often that you can experience that magic moment when the future opens up in front of you – but when it happens, chances are it will be in Silicon Valley. One of those moments came about five minutes into a demo by Layar.com at SVNewTech's monthly meeting in Palo Alto, California. 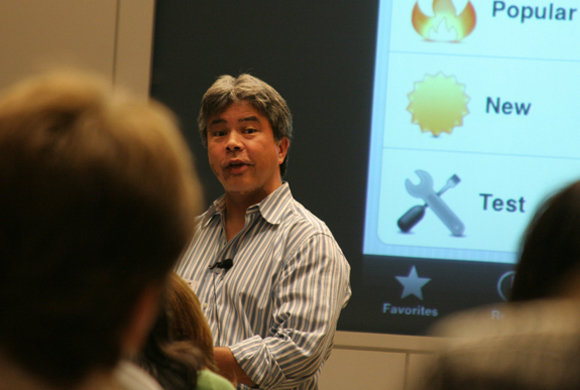 Layar's "Augmented Reality Strategist" Gene Becker was holding up his iPad to the audience, with an image captured by the device's camera reproduced on a screen behind him. He had just switched on the Twitter "layer" using his company's technology, and as he scanned the room, avatars of people that had tweeted while physically in the room appeared, along with their 140-character messages. It was a little clunky. The avatars appear flat on the screen, obscuring people's faces. The tweets were filtered by geolocation and time, but didn't really reflect what was going on in the room at that moment. But who cares? When it comes to technological jumps, clunkiness is just the last hurdle. Becker's demo suddenly opened up a way of connecting the physical world with the virtual world, seamlessly, through a handheld device. How long before we can scan our tablet to see people tweeting in real time, with messages appearing above their heads? Grab the message with your finger and pull it to the bottom to automatically follow the author. The technology is already here: an iPad, camera, geolocation, and cloud data. It just a matter of tweaking and improving the interface. Layar is already working on vision recognition to make the virtual images it creates blend in better with the real world. There are many other "layers" of course. Over 2,000 already exist according to Gene, including real-estate apps, historic pictures (see what the street you're on looked like 100 years ago), architects imaging the space they are in, crime apps that let you log a crime (or see crimes logged earlier), and so on. Artists and protest groups apparently love the technology. The Rolling Stones have even played around with it. Advertisers may love this stuff too. 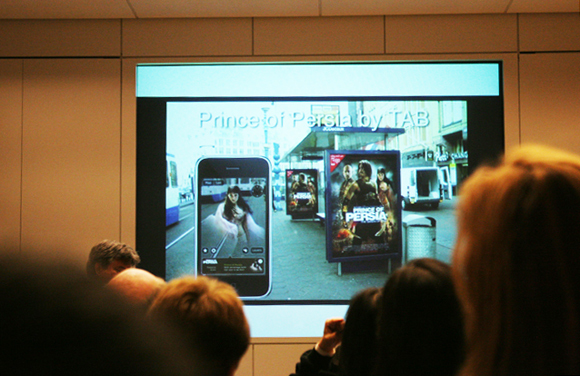 One of Becker's examples was of an ad for the Prince of Persia film – as you approach a poster at a bus stop, a character from the movie comes alive on your phone. The demo was also timely, with geolocation in the news because of Apple and its iPhone tracking and TomTom selling its data to the cops, who then used it to set up speed traps. Gene was asked about both by the tech-savvy audience. "Our terms say that while using [augmented reality], the layer will know where you are," he explained. "But we won't sell that data – it goes against what we stand for." However he would not rule out selling the data to advertisers, and admitted that login IDs are stored, but not for any length of time. The company isn't trying to make money right now. According to Gene it has 1.5 million users, which is "interesting but not enough." It's free to use and free to develop layers, and the company makes some money by offering to build layers for clients. But it is the future that counts. "We are basically in the equivalent of the silent-film days," Gene evangelized. "We don't want to kill that off by upsetting our community. We are giving people a voice." Layar was just one of four demos at the May 3 SVNewTech meeting, which was not only free, but also had beer and pizza thrown in for good measure. You have to register early to get into a meeting, and there's a waiting list. Registration for the next meeting, on June 7, is now open. The most popular demo, at least in terms of the number of questions that people asked, was presented by Green Goose cofounder Brian Krejcarek. Like Layar, Green Goose is making the most of the latest technologies to create new uses and services: in this case RFID chips and accelerometers, both of which have become incredibly small and cheap to produce. Krejcarek showed off wireless stickers you can attach to just about anything, and which should last one to two years before their batteries run out. He demonstrated their use with various household items: a toothbrush, a vitamin bottle, and a water bottle, each of which was tracked and registered by the Green Goose tech. The system works by the chips sending a signal to a base station that you keep in your house. The signal from the chips will cover your house and yard, and probably your neighbor's, as well. The way Green Goose has locked it down is by developing its own protocol and trademarking algorithms that make sense of the sensors' data output. Krejcarek seems convinced that the best use of the technology is as some kind of game platform, although we can see many more likely uses – including a few that would raise serious privacy concerns. The company also has to figure out how to deal with multiple signals (at the moment the base unit accepts only one signal and drops the rest), and how to assign movements to individuals. But with "very low" pricing, it's not hard to imagine Green Goose's sensors being used for an enormous range of applications.